European Portuguese (Portuguese: português europeu, pronounced [puɾtuˈɣez ewɾuˈpew]), also known as Lusitanian Portuguese (português lusitano) and Portuguese of Portugal (português de Portugal) in Brazil, or even “Portuguese Portuguese” refers to the Portuguese language spoken in Portugal. Standard Portuguese pronunciation, the prestige norm based on European Portuguese, is the reference for Portugal, the Portuguese-speaking African countries, East Timor and Macau. The word “European” was chosen to avoid the clash of “Portuguese Portuguese” (“português português”) as opposed to Brazilian Portuguese. The language is the same with different accents in many countries. It is a Latin based language, with Gaelic, Germanic, Greek and Arabic influence. It was spoken in the Iberian Peninsula before as Galician-Portuguese. With the formation of Portugal as a country in the 12th century, the language evolved into Portuguese. In the Spanish province of Galicia, Northern border of Portugal, the native language is Galician. Both Portuguese and Galician are very similar and natives can understand each other as they share the same recent common ancestor. Portuguese and Spanish are different languages, although they share 89% of their lexicon. European dialect map of Portuguese language. Phonetically, differences emerge within Continental Portuguese. For example, in northern Portugal, the phonemes /b/ and /v/ are less differentiated than in the rest of the Portuguese speaking world (similar to the other languages of the Iberian peninsula). Also, the original alveolar trill remains common in many northern dialects (especially in rural areas), like Transmontano, Portuese, Minhoto, and much of Beirão. Another regionalism can be found in the south with the use of the gerund in the present progressive tense rather than the infinitive. 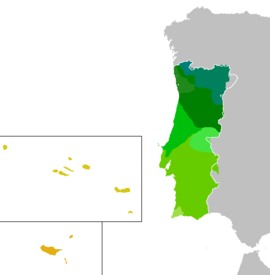 Portuguese is spoken by a significant minority in Andorra and Luxembourg. The Principality of Andorra has shown interest in membership in the Community of Portuguese Language Countries (CPLP). There are also immigrant communities in France and Germany. The Galician language, spoken in the Autonomous Community of Galicia in Spain, is very closely related to Portuguese. There is, as yet, no consensus among writers and linguists on whether Galician and Portuguese are still the same language (in fact they were for many centuries, Galician-Portuguese having developed in the region of the former Roman province of Gallaecia, from the Vulgar Latin that had been introduced by Roman soldiers, colonists and magistrates during the time of the Roman Empire) or distinct yet closely related languages. Portugal maintained its colonial rule over its Old World empire much longer than it did over Brazil. Thus European Portuguese is used as a norm of reference for African and Asian Lusophone countries (Angola, Cape Verde, East Timor, Guinea-Bissau, Macau, Mozambique, and São Tomé and Príncipe). Portugal remains a destination for post-secondary education for the elites of these places. In Europe, European Portuguese remains the learning standard for Portuguese as a second language. RTP is the Portuguese public television network and also serves as a vehicle for European-Portuguese-providing media content throughout the world. There is a branch of RTP Internacional named RTP África, which serves Lusophone Africa. ^ Baxter, A. N. Portuguese as a Pluricentric Language. ^ Clyne, Michael G. Pluricentric languages. p. 14.